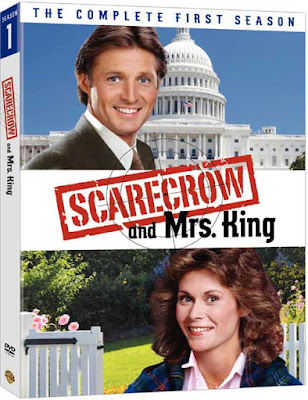 Home » Television » DVD Info: Scarecrow and Mrs. King: The Complete First Season. DVD Info: Scarecrow and Mrs. King: The Complete First Season. Welcome back to the 80s! Warner Home Video has announced that the DVD release of SCARECROW AND MRS. KING: The Complete First Season is slated for March 9th, 2010. PTA…hello, foreign intrigue! Single mom Amanda King leads a quiet suburban life in Washington DC until the day a dashing stranger shoves a package in her hands with instructions to give it to the man in the red hat. In no time, Amanda is dodging bullets, foiling assassination plots – and finding herself drawn to the dashing stranger, agent Lee Stetson, aka Scarecrow. Of course, Scarecrow has no interest in a ditsy amateur spy, no matter how pretty. But she certainly is handy in a crisis! Share the Season One fun with stars Kate Jackson and Bruce Boxleitner in this fast-paced 5-Disc, 21-Episode Set of the lighthearted series that proves laughs and romance are powerful weapons in the battle to protect national security. Scarecrow and King ran from October 83 through May of 87 on CBS and, if my memory servies me correctly, was likeable fluff.